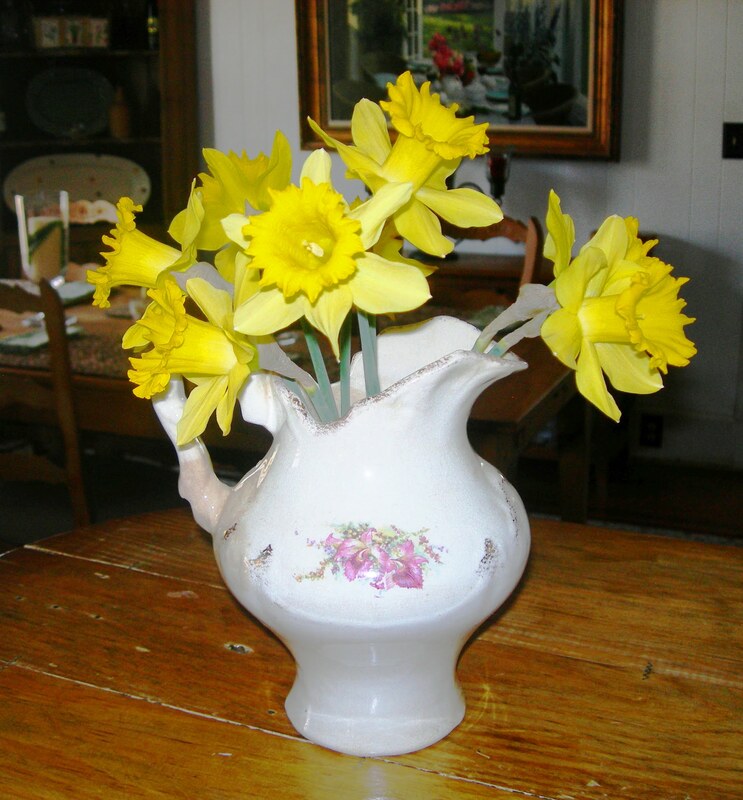 The house smells heavenly today with the scent of daffodils. I picked these from the yard yesterday. They are just shouting the end of winter! Hooray! I read that daffodils are a symbol of friendship. I spent some wonderful time with some “forever” friends this weekend. Today I thought I’d continue my house tour by showing you our dining room. These dividers separate the living room from the dining room. 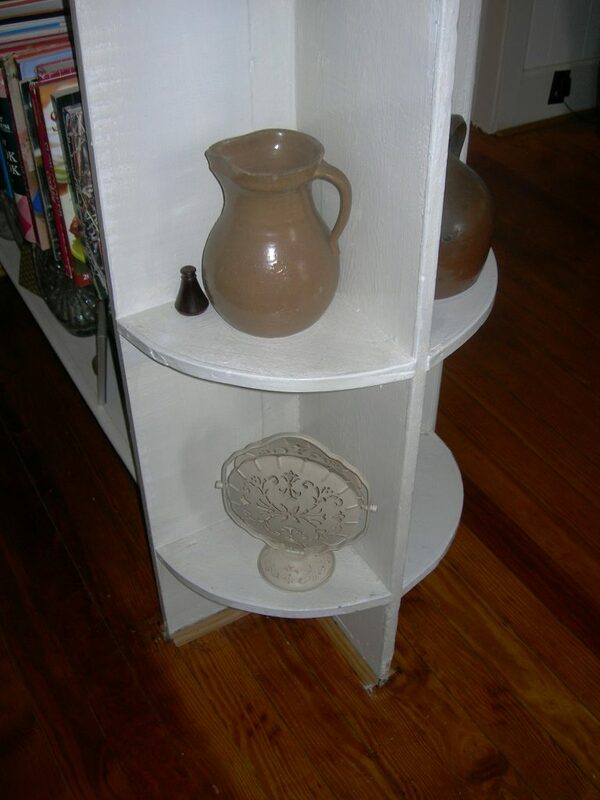 We use them to display photos, books, etc. just like my mother-in-law did. 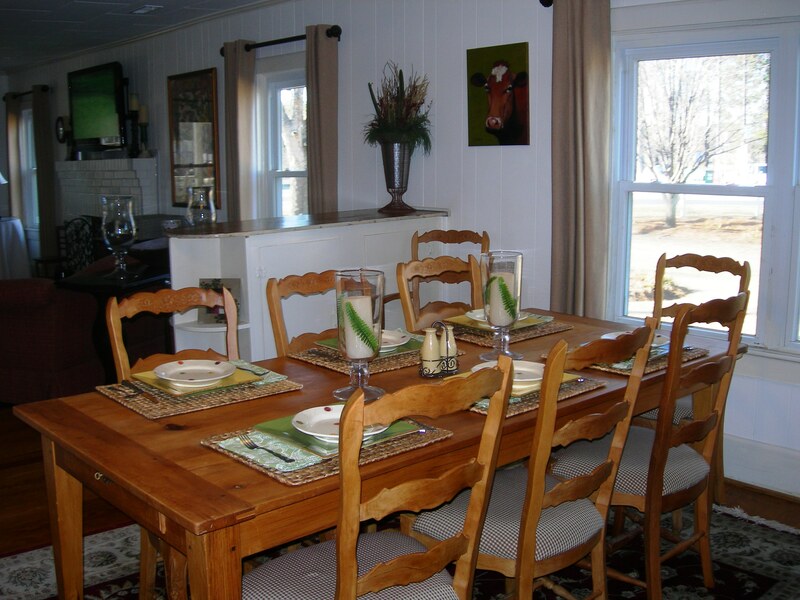 The table is a reproduction pine farm table that we purchased in McClellanville, SC many years ago. 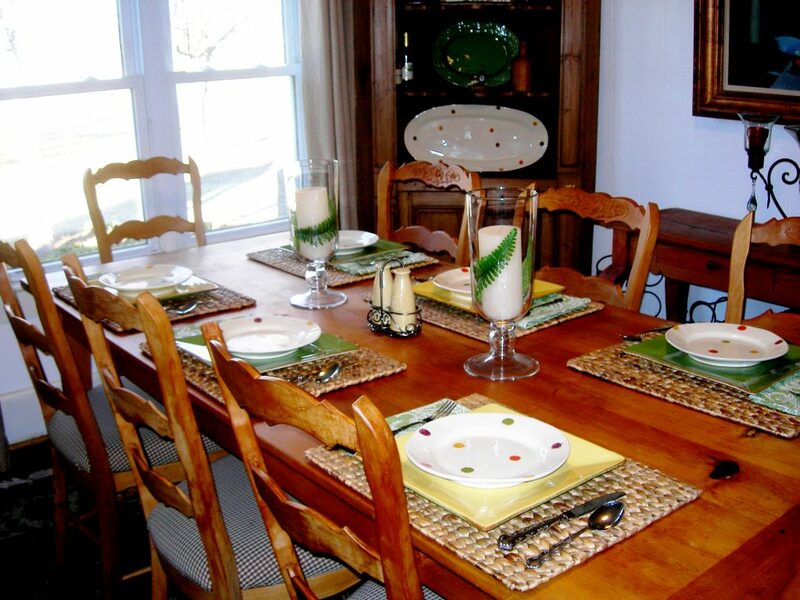 Today the table is set casually with my Vietri Italian pottery. 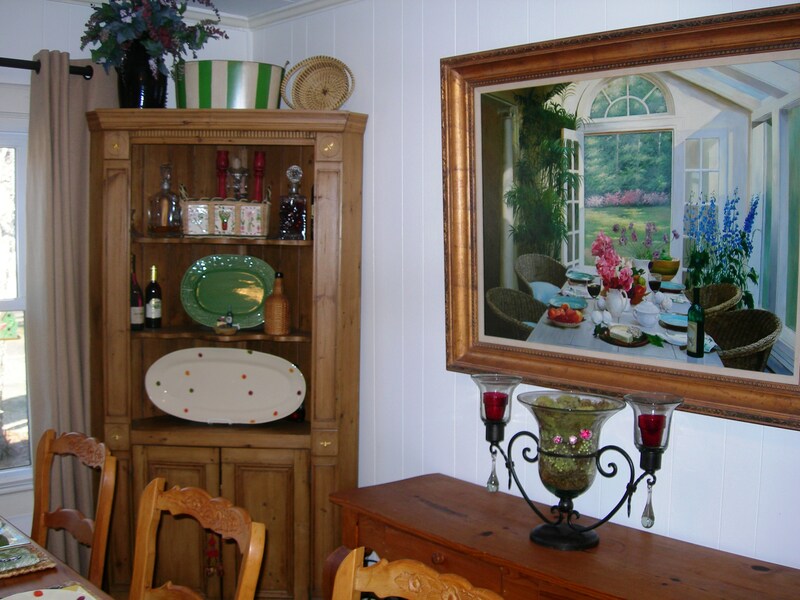 The corner cabinet is an antique that we purchased in Charleston, SC and the painting was obtained in Georgetown. It’s our family tradition to gather every Christmas Eve in this dining room. After the big meal, homemade eggnog is made and served. This tradition has been occurring for over 60 years. Do you see Daisy the Cow looking at you? That painting was a gift to me from Leo a few Christmases ago. I had seen the painting displayed in a restaurant in Lexington, SC and she spoke to me. I even named her Daisy. I told Leo that I really liked the painting because my daddy raised cattle when I was growing up. The next time that we went to that restaurant, Daisy was gone. I was so sad that someone had purchased the painting before I could. But a few weeks later, Daisy appeared under the Christmas tree. Isn’t my husband just the sweetest thing! Here’s the hutch. More cookbooks here. 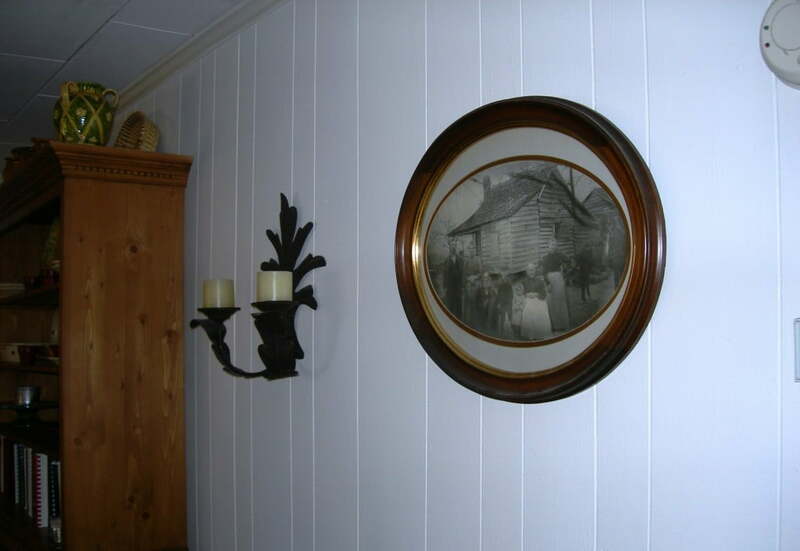 Next to the hutch is an old photo of the Windham family homestead which was located across the street. In the photo is Leo’s grandfather after whom he is named. This is one of some old crocks that we found in a storage building on the property. I wish I knew more about them. 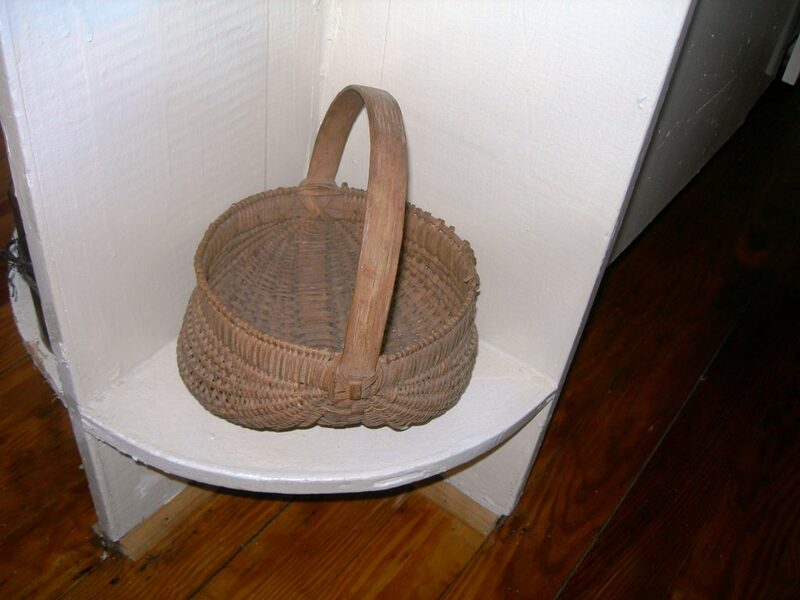 This was my great grandmother’s egg basket. My mother remembers her gathering eggs and placing them in the basket when my mother was a little girl. Well, I hope you enjoyed seeing where our family gathers for mealtime. In your comments, tell me about some of your family traditions. When my Grandmother’s home place was being cleaned out to sell, they had an estate auction. My Grandmother walked around with me and showed me things she remembered from when she was a little girl, one of the things she showed me was an egg basket just like yours. She collected the eggs in the basket. I tried to get it for her, but I couldn’t compete with the antique dealers. The basket went for $140. I did buy a box out of the barn not knowing what was in it. I got two pieces of depression glass that she remembered as being her Mother’s, which started me collecting pieces. I enjoyed the tour of your dining room, family is so important. Seems i am late visiting your lovely house but then i am very happy to know more about you ang your collections indeed I am fond of collecting snowman and tried sewing by hands snowman socks and sleeves of shirts for fun though i am A simple housewife and busy doing household chores i put an extra times gathering and collecting things all about snowman. I am from Manila Philippines want to exchange ideas from your collections and country as well God Bless. The house looks beautiful and Uncle Leo is doing a great job with his garden. Everything is so nice. It brings back wonderful memories and made me cry! We may be heading South sometime this fall. I will let you know if and when we are coming. Please give Uncle Leo a big hug from me and kisses to you! 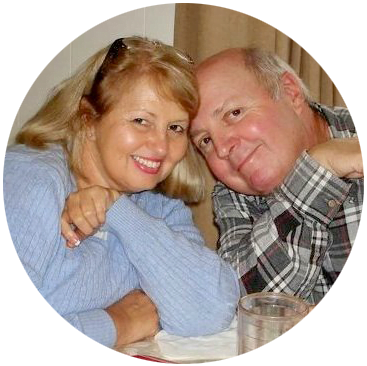 I love the tradition and charm of your home 🙂 I have also added you to my fb so my friends may share in the beauty and charm of your website. As I expected your house is beautifully decorated with everything in it’s place. Oh, how jealous am I! Would love to have a private tour one day! You and Leo seem to make a great team. I’m really happy for you! Thank you so much for visiting my blog today and leaving me a sweet comment! I have joined your site and I must say your house is so charming! I just LOVE that painting above your buffet/desk, it just looks like your sitting in that room. Very Lovely!! Hi Jane, Your home is very inviting! I loved the egg basket story, how cool is that? And the painting in the dining room is wonderful. 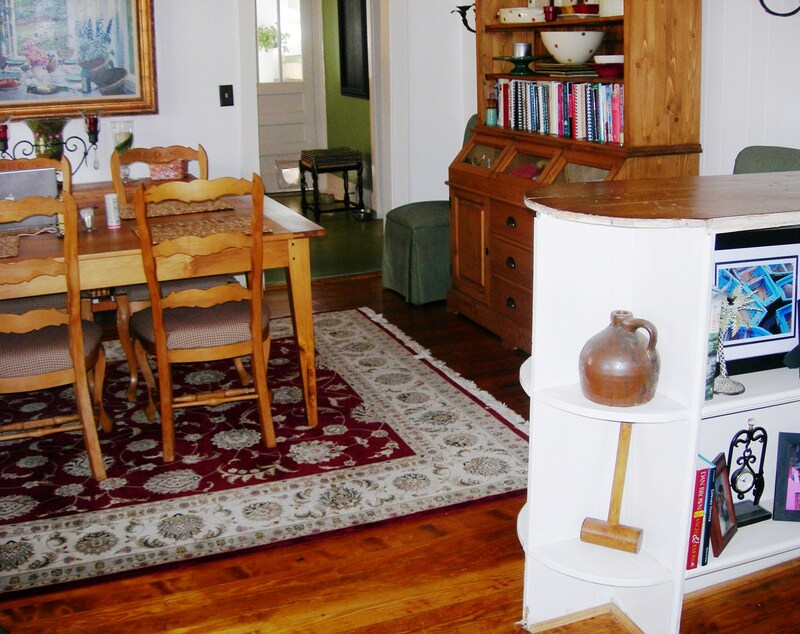 Your dining room is beautiful! And the daffodils…oh my! Love this little bit of sunshine this morning. What a great tour of your beautiful home. It looks so cozy and comfortable which I am envious of. I’m still trying to get to that point. Oh, and I am praying for daffodils! It’s still cold and miserable in Ohio. Thanks for leaving me the nice comment about my fabric rug. I think I will be making one for every room. Your home is so cozy and charming. 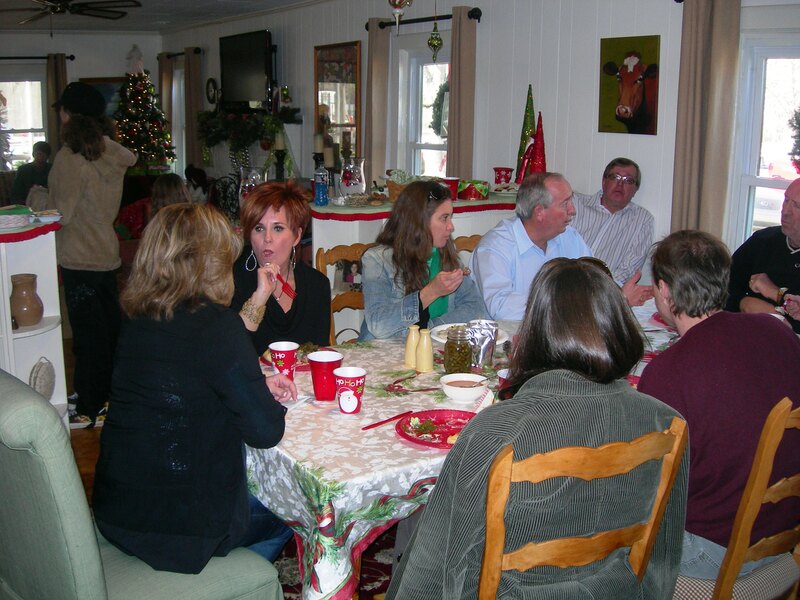 I love seeing how your table looks at different times – all alone and then filled with friends and family. You have made your house your HOME for sure! I am so jealous that you have daffodils blooming in your yard! We just got 4 inches of snow last night. Enjoyed your tour! I have really enjoyed “visiting” your home! I am in love with it. I feel like I have just been by to see you! Lovely familiy and setting. Thanks for visiting me today and becoming a follower. Glad to have you. Hi and I’m so glad you popped in to see me and I do hope you’ll come back. 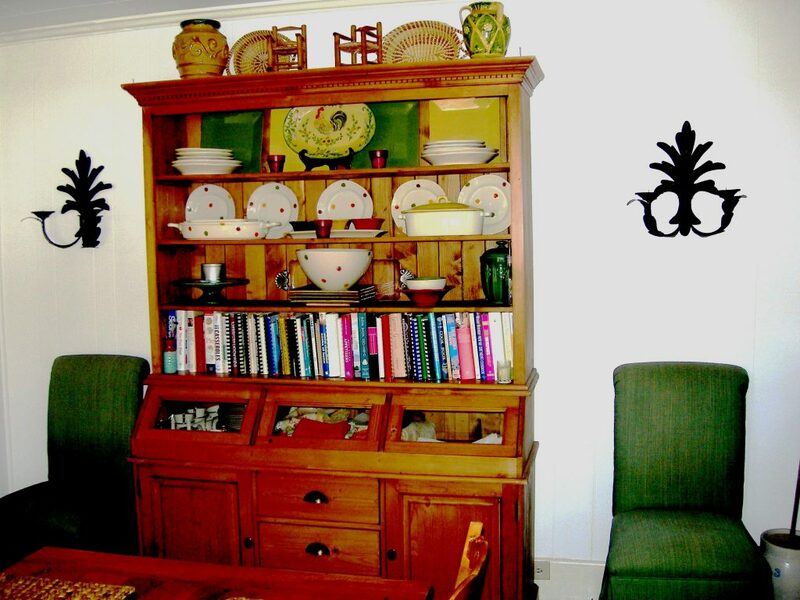 What a lovely dining room you have and I have so enjoyed seeing all of your treasures. Those polka dot dishes are just the cutest thing and I spy that awesome platter that goes with them in your cabinet!